Episode 24 of the DKNG Show on Adventures In Design is now up! Listen to the first half for free below. Become a member of the Circle Of Trust to hear the full episode as well as see the latest projects we've been working on! Episode 23 of the DKNG Show on Adventures In Design is now up! We don’t often dip our toes into the country music world but when we do it’s always a fun ride. This was the case for a recent set of posters we created for Eric Church’s two-night stop in Toronto, Canada as part of his Double-Down Tour. We decided to run with the gambling theme and create a set of classic casino slot machines, but with lots of Eric and Canada specific references thrown in. Each poster is a 12” x 24” four color screen print on French Kraft-Tone Manilla Yellow 100lb cover stock. Each poster has a super limited artist edition of 50 pieces. Check out our initial sketch below along with closeup photos of the finished prints and a time-lapse video documenting our design process. You can also get a look at the “Chief” poster that was available exclusively at the show. 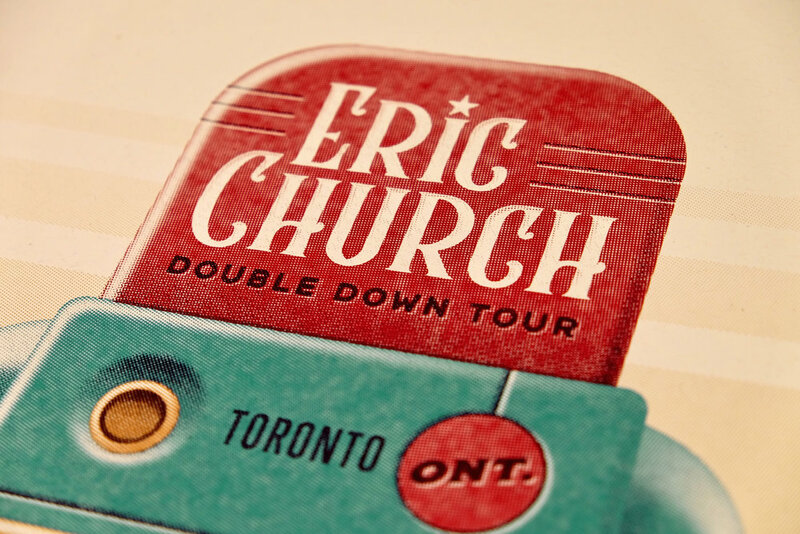 The Eric Church Toronto posters go on sale on Tuesday, March 12, at 10am PST in the DKNG Store. Episode 22 of the DKNG Show on Adventures In Design is now up! Being asked to create an officially licensed pin for Disney is an enormous honor. We make it a goal of ours to always visit the enamel pin displays at the Disney Parks in our home state of California, and are always taken aback by the enormous body of work one company has offered to the world of pins. To be specifically asked to create a pin for Mickey Mouse is on a whole other level. It’s a double-edged sword, re-interpreting an already iconic and perfect design. We didn’t want to steer too far away from Disney’s artistic expression but also wanted to put our own personal spin on the classic character. We pride ourselves on finding the hidden geometry in all aspects of design and illustration, and it’s clear that Mickey is built with a number of geometric shapes. Just draw three perfect circles and most people will be able to see the vague resemblance of Mickey's head and ears. We took this notion and applied it to our process. Our goal was to celebrate what makes Mickey classic, using a recognizable pose and color scheme, while celebrating the geometry and line work that would otherwise be hidden. We hope we did Mickey justice. It’s the least we could do for such a handsome nonagenarian on his birthday. Episode 21 of the DKNG Show on Adventures In Design is now up! We’re excited to announce that DKNG will be returning to Memphis this spring for an immersive two-day vector illustration workshop at the Creative Works Skill Camp! Join us on April 4-5 for an intimate, in-person workshop detailing our poster illustration and design process, from concept development through final execution. The workshop includes 16 hours of instruction along with keynote talks each night. The workshop is limited to only 30 participants so sign up now to reserve your spot! We’ve always been big fans of the Back to the Future franchise and hoped to someday have the opportunity to illustrate the iconic DeLorean from the film. Thanks to Mondo, that dream came true in the form of both vinyl packaging and now two ultra large 36” x 24" limited edition screen prints. The art itself is inspired in many ways by the depictions of the DeLorean that came before it. We knew that a profile view of the car has been interpreted by countless artists in many beautiful ways, so our goal was to create a new take on this viewpoint by zeroing in on the detail of the time machine, both exterior and interior through the open gull-wing doors, all while having fun with including a few easter eggs. Creating the main edition of the poster in a neon 80’s color palette was a must, but just in case it wasn’t colorful enough, we created the variant edition on rainbow foil for an extra shimmery effect. Each posters is a 36” x 24” four color screen print. The main artist edition of 60 prints is signed and numbered by DKNG on 100 lb. white cover stock. The variant has a super limited edition of 35 and is printed on 10pt metallic rainbow foil. Both prints are available in the DKNG Store on Monday, January 7, at 10am PST. Limit one of each poster per customer, these prints are limited editions that will not be reprinted. Check out close up photos of the finished prints below. You can also check out the original vinyl packaging here. As Dave Matthews Band wraps up another year of touring, we were excited to take on another gig poster for the band, this time for their show in Boston, Massachusetts. We were inspired by a cold winter night on the Boston Harbor, lit by the famous Boston Light lighthouse, and we contained the whole scene in a classic camping lantern, complete with moths buzzing around the flame. The poster is an 18” x 24” three-color screen print on Neenah Paper Patriot Blue 100 lb cover stock. Check out a few close-up photos of the finished prints below, along with our initial concept sketch, and a video covering our design process. The Dave Matthews Band Boston, MA poster is available in a very limited artist edition of 60 prints in the DKNG Store. Due to the limited nature, the sale is restricted to only one print per customer, and once the poster sells out it will not be available in the future.